Activists fixate on the future: impatient for the world we want to see. But falling into the capitalist trap of ceaseless productivity leads to burn out. 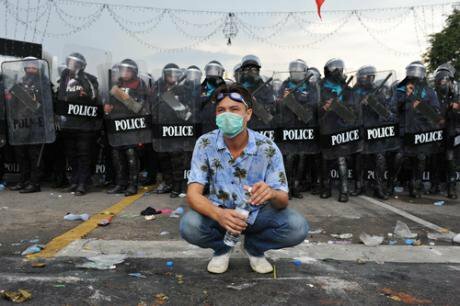 An activist pauses during a demo in Bangkok. Credit: 1000 Words/Shutterstock. Although a lot of activism is anti-capitalist, we are not yet post-capitalism. Even as activists seek to build a world beyond capitalism, we still fall into its traps. One of these traps is the need for ceaseless productivity. Without meaning to, activists transpose capitalist definitions of ‘success’ onto social movements. We’re either winning or losing, with nothing in between but targets and growth. Within capitalism, if you're not growing and improving, you're failing. This also applies to political struggles, but the danger is that when we don’t see the progress we want, we start to feel like we’re screaming into the wind. We aim high because we have to and because there is so much to do: we feel the pressure to make up for other peoples' complacency. Some of us fight because our lives depend on it, and safe survival is hinged on change. When we're faced with violence, resistance is not a choice. So we tell ourselves we can fix anything. We tell ourselves we’re powerful, even when we don’t quite believe it. When the odds are so stacked against us, it’s all we’ve got to keep going. So that’s what we end up doing: keeping going. For sustained periods of time. Activism knows no weekends or boundaries. We give our whole selves to our struggles. Rest days are spent at protests and fundraisers; evenings are for meetings. Injustice won’t wait, and so we spend our lives racing it. We give insurmountable energy and unpaid labour, and often don’t see the results we want. Amid all of this, our very own hearts can drift away from us, anxiety-filled and future-focused. We’re constantly talking about self-care, but rarely practising it. We know we should take more breaks, and they’re only ever just past the next direct action, protest or meeting. But we don’t always get there. Gradually and then suddenly, we can find we just cannot keep going. Both mentally and physically, we stop. Resistance is our speciality. We’re so used to resisting that we resist warning signs from our own minds and bodies. Eventually, we have to learn the tough lesson that we can’t push through when our health is floundering, no matter how desperate we are and no matter how urgent or important our struggle is. Even if your life depends on your struggle, when these times strike, you can't force yourself better. In a capitalist culture of pace, progress and unending to-do lists, where growth is fetishized and everything is urgent, trying to push yourself into a "better" place seems like the logical, sensible thing to do. Sometimes it feels like the only thing to do because anything else feels like defeat. But doing this only compounds and perpetuates, instead of relieves, the pain. Activists fixate on the future: impatient for the world we want to see. We know time is a finite commodity, so we pressure ourselves to make the most of it. But we commodify ourselves in the process. When we burn out, our first instinct can be to run away, hole up and switch off from everything, because we know our default is to jump straight into reacting and fighting. And taking a solid break is often desperately needed. But what mechanisms do we have in place for when we do ‘return’? If we don’t change the structures we operate within, we make the mistake of switching off until we’re feeling revitalised and invincible, then returning to fall into the same trap again. Yet there is a hidden middle ground between feeling powerful and powerless, and it is one of holding. When it feels like there’s so much to fight, and you’re running out of the energy to fight it, or when you’re burned out and sick and can’t leave your bed, sometimes holding yourself is all you can do. Not physically, but psychologically. Holding is the most basic form of reassurance; we hold babies to calm them. When it’s physical, holding is the acceptance, valuing and validation of someone’s stillness, their very being. Holding allows us to just be; it gives us sanctuary. When it’s psychological, it fulfils the same function. We can provide this same feeling for ourselves. When we feel crushed and exhausted, it’s important to hold ourselves in still acceptance, without pushing ourselves onto one side of the powerful-powerless binary. When there’s so much to fight, our hearts are pushed and pulled in several directions at once. By holding yourself, you reclaim your heart and remind yourself that you are not an output: you are a human. We must remember this within activism more generally, and restructure our organising to avoid capitalism’s pitfalls: we are not outputs, and an individual’s value to a movement is not contingent on how much they can produce. This in itself not only perpetuates capitalist values, it reinforces ableism, ironically within movements that strive for a better and more equal world. It aches when our sore, heavy hearts are deeply connected to external situations that we cannot control. When our government is going to war in Syria and are cutting domestic violence support services, we know we must fight. And we do fight. And we should fight. But when we hold ourselves, we undergo the radical realisation that we do not have to place ourselves within everything to have purpose. It’s easy to overlook the power in acknowledging atrocity. However, recognition is the bedrock of resistance. When we are overwhelmed, sometimes all we can really do is take stock and bear witness to the devastation going on around us. Sense making and constructing truth are the foundations of social justice. Without this, our struggles have nothing to stand on. We are not able to fight everything, and even when we do fight, we are not able to win every time. Some things are bigger than us. That is not our fault. Contrary to capitalist logic, that does not make us flawed or unproductive. Within our movements, it does not make us lazy or weak or failures. It makes us human. Within this context, the worst thing about burn out is that you don’t know how long it will last. Once you burn out, you can’t make any promises for when you’ll be back in action. But health does not run to a timer, forcing only causes frustration and we do ourselves more harm by living to deadlines. It is only by holding, not forcing, that we can find our feet again and secure solid ground when everything else is shaking. In a world where productivity rules, this in itself is true resistance.